A device that reduces the amount of calcium, magnesium, and other minerals in water using ion exchange. Hard water causes scale to form around faucets, in kettles, and inside pipes. It reduces their flow and also causes clogs. Salt-free water softeners do not remove the calcium and magnesium that cause scale. They alter their form so that scale is no longer able to build up. Salt-based water softeners are the most effective at reducing hardness. However, they add sodium to the water, so it is advisable not to use the softened water for drinking. 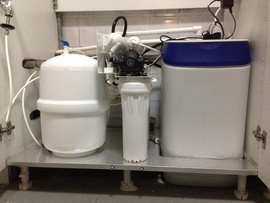 Water softeners range from $500 to $1,500, depending on the quality and the capacity.